We all do our bit to reduce our levels of plastic waste, whether it’s washing and recycling our plastics or simply not buying them to begin with, but plastic microfibre pollution is still a big problem on a microscopic level. Plastic bags and other single-use plastics cause untold damage to the oceans ecosystems, but even without them wildlife are still ingesting tiny fibres and ultimately dying as a result. 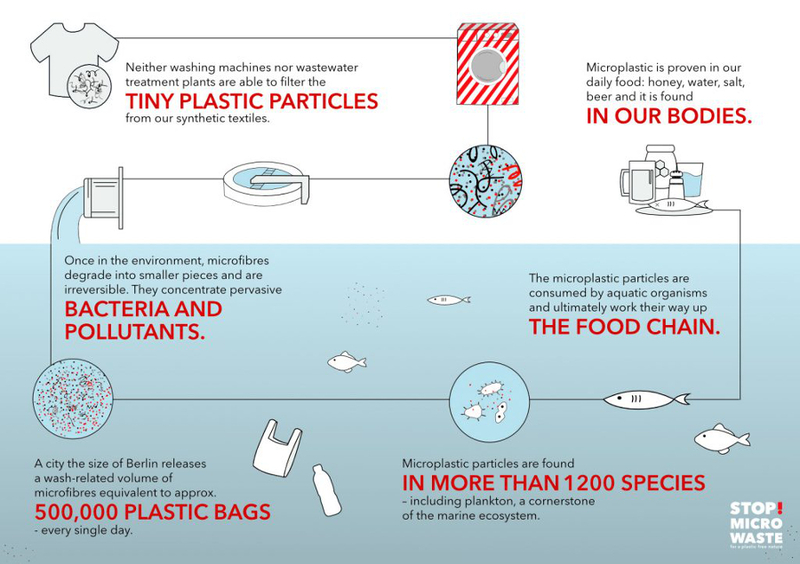 Tiny plastic particles and synthetic fibres often come off of our clothes after we have washed them, and as small as these plastic fibres and particles are, they still add up to a big problem. The GuppyFriend washing bag was designed to be the solution to this problem. The GuppyFriend washing bag is simply something to place your clothes in while they’re being cleaned in the washing machine. While your clothes are being cleaned they will begin to release tiny synthetic fibres which the Guppyfriend bag can catch. Just place your clothes inside the Guppy bag, wash as usual, take them out and look at the hems on the inside of the bag. You’ll notice that there are fibres stuck in there that would have otherwise been drained away. Microfiber pollution is something that we’ve all been blind to, but GuppyFriend holds up a magnifying glass to the problem by catching the clumps of harmful loose fibres that we’re releasing into the oceans after every single wash.
Any loose fibres that come off of the clothes in the washing bag will be trapped by the hems for you to dispose of properly. 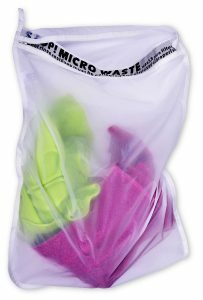 Every last square inch of this bag is made of polyamide and has been designed to shed nothing of itself while washing clothes. The tight polyamide mesh lets in water and liquid detergents without shedding any microfibers or compromising on cleaning power. Because this bag is made from polyamide it’s eligible for recycling along with groups of identical materials. Once it’s worn away after years of washes, you can recycle it safely, or even send it back to the manufacturers directly to help them make more. The Guppy Bag is a wonderful tool for stopping micro pollution, but it is by no means a permanent solution. Although practical and eco-friendly, the manufacturers believes that we could be doing more to keep pollution down. STOP! 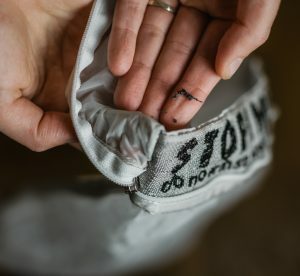 MICRO WASTE is a non-profit organisation that is committed to eliminating microfiber pollution and preventing the damage it causes to the ecosystem. Founded by a group of passionate surfers and nature lovers, this charity helps to reduce the level s of pollution in our oceans and rivers. As well as creating solutions to the problem, they also raise awareness and contribute valuable research towards the global problem of microfiber waste and pollution. They partner with the German Textile Research Institute and Fraunhofer Institute to help push progress towards a permanent solution to the problem. The GuppyFriend washing bag is their way of getting everyone involved in their cause and providing people with a practical way to cut down their waste. Why not give it a try today and see how many synthetic fibres you can catch?